I recently built a r*s 4U NTO and have run into an issue I'm hoping someone here might be able to help with. I finished the pretty minimal build, plugged it in, and I'm getting nothing from the outputs. Based on that I checked my power supply, board headers, and continuity around everything and it all measures correctly. I emailed Ralph who recommended a few things to measure, all of which measured correctly except one. 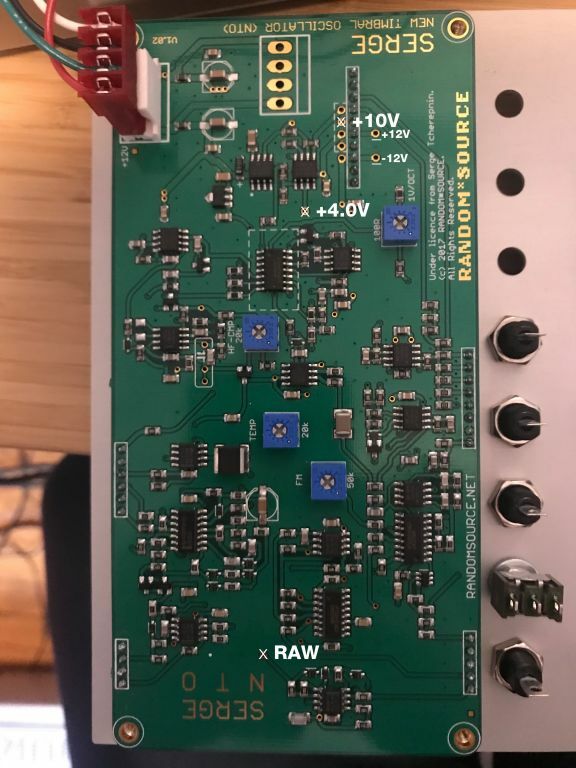 He told me to check the "raw saw" output from the board with my scope, which looks like it is just outputting a solid 11.4v with no oscillation. Everything measures correctly except the "raw" pad. Has anyone else seen this behavior? Is there something I'm missing? What can I check next to continue to trace this issue? Thanks for any input and assistance. These comes full populated no? I just would check the psu voltage, the solder points at the headers and pots/jacks if all those are right all you need is a replacement main board! Yes, that's true. I checked the PSU again and it's all good. I finished my DSG last night and it works fine in the same boat. I'm gonna guess the CA3130, the integrating IC in this circuit, is dead. It's a sensitive device, and if it's dead nothing works. You checked the DUSG in the same boat, but with the same cable? Your cable wiring could be at fault? Worth a check. If the regulators, reference, and power test points check out it's not the power cable. Oldenjon is at least in the right neighborhood. If the raw saw is at 11.4v that means the integrator in the core of the oscillator charged up without resetting. So something in the reset circuit isn't functioning. Make sure the output of the integrator is getting to the comparator ant the comparator is getting to the FET (I assume it resets with an FET). Thanks, that’s a good pointer. Are you familiar with this board? Any tips on what to check/measure to see if this is the case? I have seen unsoldered joints and parts missing on some RS PCBs, check all parts with a loupe to ensure components are soldered, or just send it back - with no schematics or any other 'DIY' info it's all Lombard Street to a China orange you'll figure it out - if you have followed tobbs advice already and that all checks out. Yep, indeed. That’s what is going to happen. I’m sending it back to get checked out and repaired. Thanks for everyone chiming in. Jumping in this thread as I've had a NTO (with my Bestia II) a few month ago but never got it to work so far. I check the test points mentioned by Emenel in first post and get the same results (everything ok, except the raw outlet outputting a steady voltage). Couple of days ago, I re-did all solder joints just in case. Any idea what I could check ? I tried emailing Ralf but did not had any reply to my last mail, so far.